The tall bimah will appear lower and closer to the congregation. The height of the Holy Ark hasn’t changed, but the first step to ascend the bimah is closer to the congregation because the lower bimah has been extended towards the congregation by permanently removing two rows of seats. A permanent and integrated ramp has been added to the left side of the bimah. This addition will enable everyone to ascend the lower bimah with ease and dignity. A chair lift will still enable those who need it to ascend to the upper bimah. Hearing devices have been upgraded. Those who depend on hearing enhancements can walk anywhere in or out of the sanctuary up to 500 feet and still hear everything in the service. New carpeting throughout the sanctuary, Wolf Toomim Hall, the Karff, Barnston, Friedlander/Levy, Fleishman Family and Lasher Family hallways brightens and updates the spaces. New coverings for the bimah chairs integrate with the color scheme of new carpeting, new wallpaper in the sanctuary, and other new furnishings. Behind the bimah, the Gathering Room has been refurnished and the bathroom has been remodeled and enlarged. The choir practice room has been lined with shelves to hold our new High Holyday prayer books and both rooms are carpeted and suitable for welcoming bimah guests and families. One of my goals has always been to transform our sanctuary, which welcomes hundreds each week, into a warmly welcoming worship experience. Standing closer and speaking with, rather than preaching to, the congregation will continue to be our benchmark; and, now we can do it in a space that responds to our congregation’s spiritual needs. Nearly two years ago, I stood in the sanctuary and said to those with me, “I wish we could do something about the carpeting.” Some weeks later, the first flood overwhelmed the neighborhood and inundated our sanctuary. “Be careful what you wish for” might be the lesson, but the results left us with a challenge we overcame by assembling experts who love Beth Israel and participated in the transformation. Though she wouldn’t like the recognition, there are few words that adequately express my appreciation for Shirley Toomim’s role in the transformation. Her eye for texture, color, style and efficiency enabled us to trust her choices to enrich such a grand space. Her attention to detail and to the schedule has brought us to our completion on time and on budget. It’s not a miracle; it’s Shirley. On Friday, January 20th, at 6:30pm, we’ll reveal the sanctuary, sing joyfully with Cantor Mutlu on Down Home Shabbat, honor Anna Rosenbaum and her family on her bat mitzvah weekend, express gratitude to Houston Jewish Federation for their support and generosity, recognize Mayor Pro Tem Ellen Cohen for the role of the City of Houston, and welcome New Members to the bimah for a blessing. 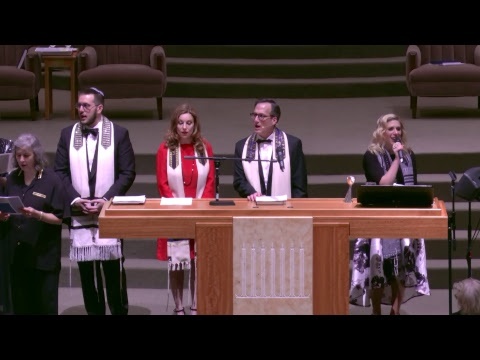 It’s an inauguration that you won’t want to miss and an occasion at Congregation Beth Israel that will forever be recorded as part of its rich and enduring history. On behalf of Cantor Mutlu, Rabbi Scott, Rabbi Herman, David Scott, Michael Jenkins, Joan Gelfond, Patrick Colbert, and Bruce Levy, I thank you for being present to witness another sacred step on our sacred journey at Congregation Beth Israel. May God bless you and your family; may God bless Beth Israel.